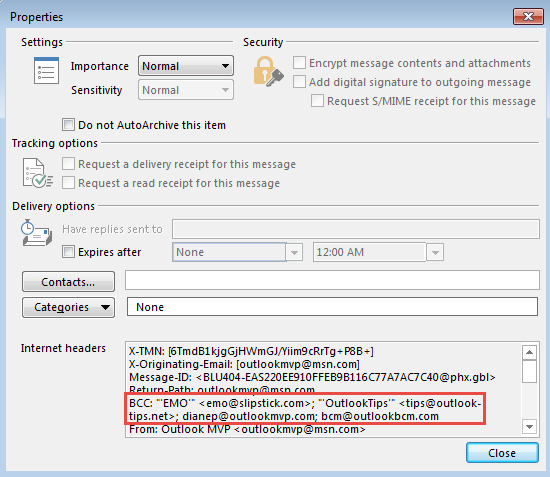 While this reason for this article no longer exists now that Exchange ActiveSync connectivity to Outlook.com has been shut down, this macro remains a useful example demonstrating how to read a message header using a macro. To make it easier to see the just the recipients, use a macro to display the CC or BCC addresses in a message box. Create a button on the ribbon to run the macro, then select a message and click the button to display a message box containing the BCC addresses. If you need a copy of the recipients, click on the message box and press Ctrl+C to copy. To check your macro security in Outlook 2013, go to File, Options, Trust Center and open Trust Center Settings, and change the Macro Settings. Select the ViewBCCAddresses and click Add to add it to the group. Click Rename to give the button a friendly name and select and icon.